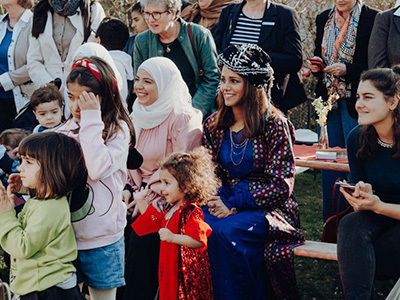 Mrs. Schröder-Köpf was in attendance for the peaceful celebration of the center which opened in 2018. She is a member of the Landtag of Lower Saxony for the Social Democratic Party (SDP) and is the former wife of German Chancellor Gerhard Schröder. The event was attended by many wonderful women from Iraq, Syria, Afghanistan as well as Kurdistan. 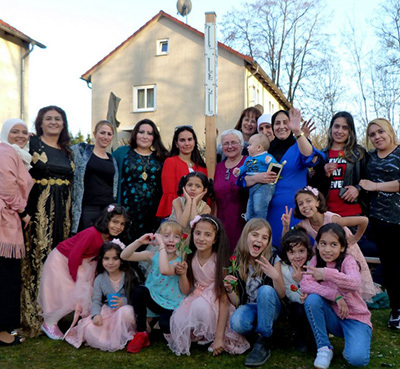 Kurdistan was able to be represented thanks to the help of Mrs. Doris Schröder-Köpf. Mrs. Schröder-Köpf was lovely in her role and recounted a moving story of a refugee’s journey from her trip through Europe. Official Town representatives were Monika Ritze and Mrs. McDowell, a Protestant Priest from Celle also participated. 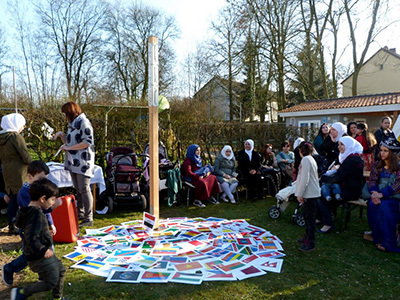 What Mrs. Schröder-Köpf did not know is that she would unveil a Peace Pole and be introduced to our Flag Ceremony with use of Country Flag cards. As the garden of the new Community Center “Womens Rooms- Womens Dreams” or Space for Dreams in German: Räume and Träume” were small, but the atmosphere remained joyful. The flag ceremony was filled with laughter, dancing and prayers for Peace throughout the World. The news reported that the event was a happy success, and was quoted saying “The Peace Pole was enthusiastically accepted by the guests“.